Zachary and Jessica both returned for a second visit. 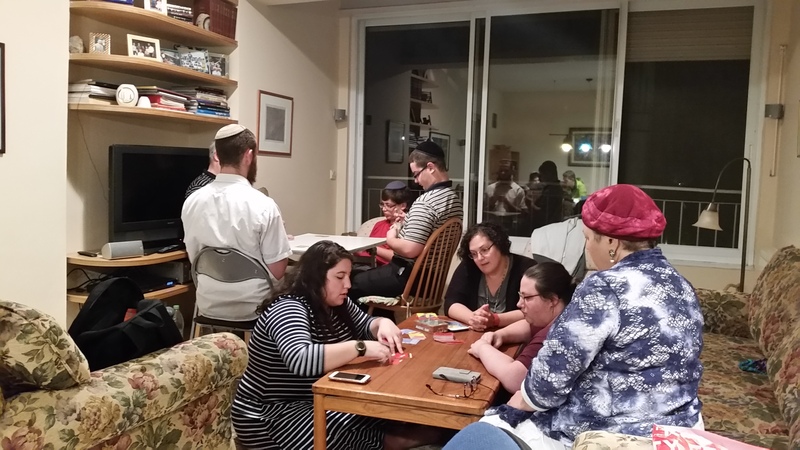 Binyamin brought T”Y to game night because they won’t be able to make it to Games Day next week. First play for all of us except for Binyamin and T”Y. 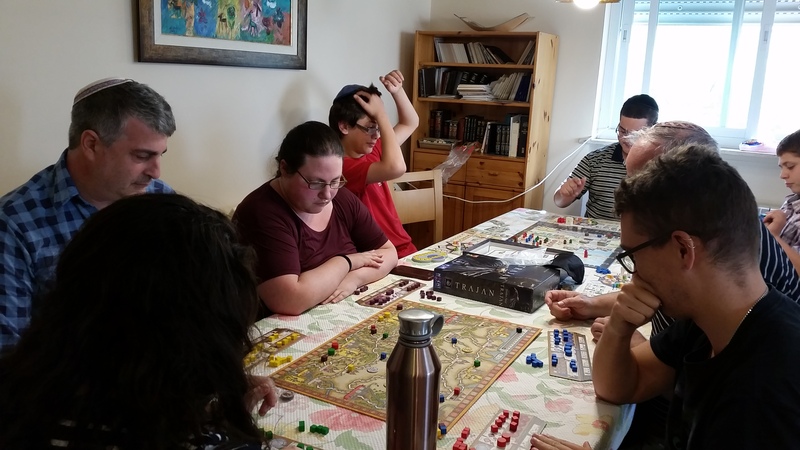 Of course I’d heard about this game on BGG, but I never really took a closer look, assuming it was some kind of long civilization building game. It was entirely unlike what I was expecting. The game is simply a card game, a cross between Fairy Tale and Race for the Galaxy. The game comes with huge over-produced but beautiful boards and bits in a large box; but it’s just a card game; the boards and bits are essentially superfluous. Each player gets 7 cards. Pick one to play and pass the rest to your neighbor. Repeat until you’ve each played 6 cards. Repeat 3 times (a total of 18 cards). That’s it. The cards can “produce” resources, give you military power, give you victory points, add to sets (that also give victory points), or have some other minor effect (give you cash, reduce the cash you need to play something). Many of the cards also allow you to play future cards for free, i.e. if you have card A in play, you can play card B without requiring its resource cost. In addition to the above, you can also toss a card out for 3 money, or place it face down to activate one of the three stages of your city, each of which requires some resources and gives you a similar benefit to playing certain cards. Resource “payments” is not actually a payment; you just need to have it in play. A resource never gets used up. If you lack the resources you need to play a card, but one of your neighbors’ has that resource, you can pay two cash to that neighbor and utilize his or hers. That’s it, really. What’s good about it is that you have to pass away all those cards you want while deciding which one to play; as the game progresses, you might want to not pass a card that will give your neighbor too many points. You also have many areas in which to concentrate: the brown cards, the grey cards, the blue cards, building your city, the green sets, etc. Naturally, you won’t get the cards you need to focus perfectly. Like certain other games, if you are focusing on a strategy that others are ignoring, you are in much better shape than if you are competing for the same card types. What’s bad about the game is a) it’s really light. That’s not much of a problem, but you might have been expecting something more substantial. 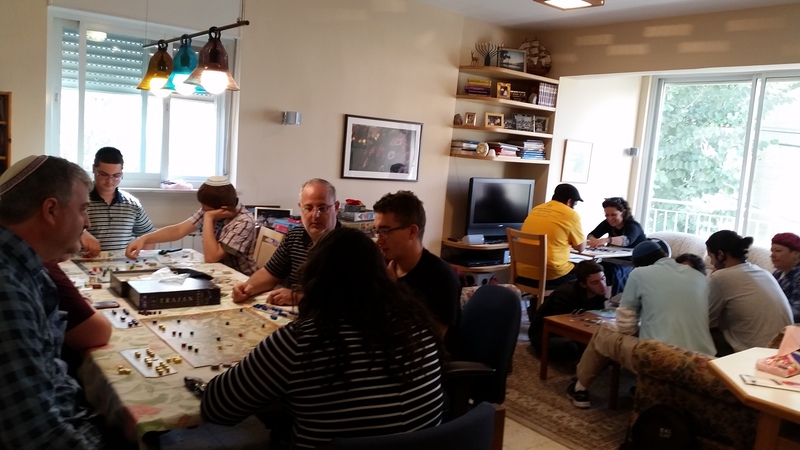 And b) the tableau and its effects become crowded and difficult to review as the game goes on. You may have 12 cards that you can play for free now; each time you get new cards, you have to review all the cards you have in play and check the names of all the cards you were passed. Then you have to do the same for each of your neighbors. This can be time consuming, so, in my first game, I didn’t do much peeping into my neighbors’ fields. But you really have to in order to do well. It’s really, really Eurogamey: the theme might as well be vegetable gardens as ancient wonders. In any case, I didn’t notice the theme while I was playing, despite the nice artwork. And there’s hardly a whiff of confrontation. You get certain extra points if you have more military strength than your neighbors at the end of each round, but they only lose one point for it if you do. The rest is simply denying them the cards they need. We enjoyed it and would play again to explore it more. Nadine in particular liked it and found it easy to pick up and understand, compared to some other recent games. Nadine concentrated on blue cards but didn’t succeed, as you can see. I tried for early brown resources and then green sets, with some late military might (late military might is worth a lot more than early might is). I don’t really know what Binyamin did to win. Zachary requested this, and it was his first play. I think he enjoyed it, but I don’t know anything about how the game went. First play for Jessica, who is probably the brightest non-gamer to join our group. She professes to be confuses initially, but she picks up games very quickly. I helped her through the first few rounds, but she was already making confident and reasonable choices by mid-game. Nadine was first player and achieved a tobacco monopoly, though she never got any corn. She took a mid-game Harbor in place of a Factory. I was second and took an early sugar, a coffee to play in front of Jessica, and a Factory. I only got a trade good at the end of mid-game; enough to buy two big buildings, but not quite enough to buy anything else. Jessica had the first trade good, a coffee, and Guild Hall, filling out the entire building. First play for Jessica. As you can see, I lost every game I played this evening. 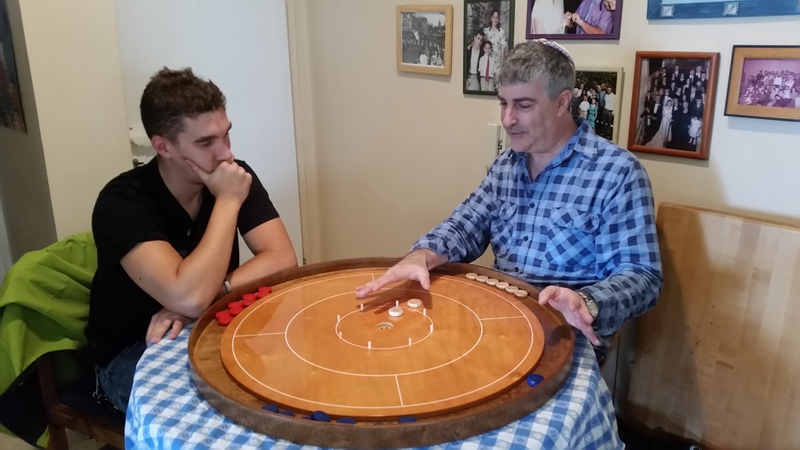 I suggested this game because it was a light game for five, and we hadn’t played it in quite some time. Still a fun game, though we still can’t figure out the rules for how dogs work. I think I understood it once, but I lost it again. With five players, I wasn’t able to get anything approaching a straight flush, but I had a mid-range of three and four of a kinds. I took some mid-game wins and second places, but the rest of my attacks, including Agincourt, I was defeated and wasted my resources entirely. 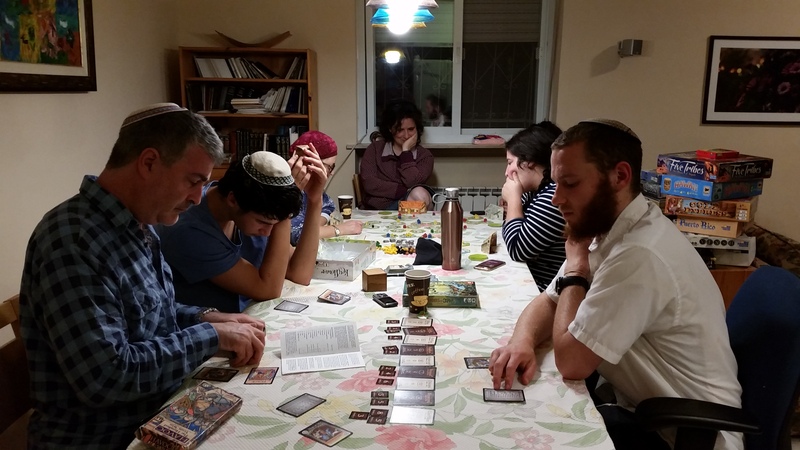 Binyamin was behind at mid-game, and he only came in first in the seventh battle, but he squeaked out a win with that. 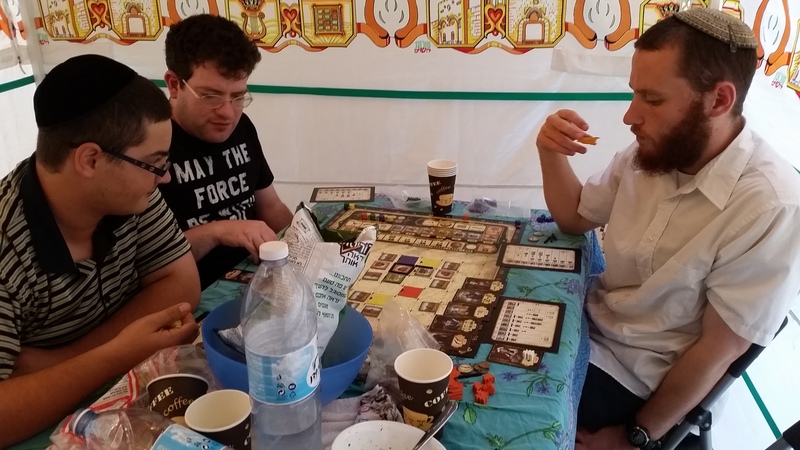 A bunch of regulars were out teaching games at some sort of other event. 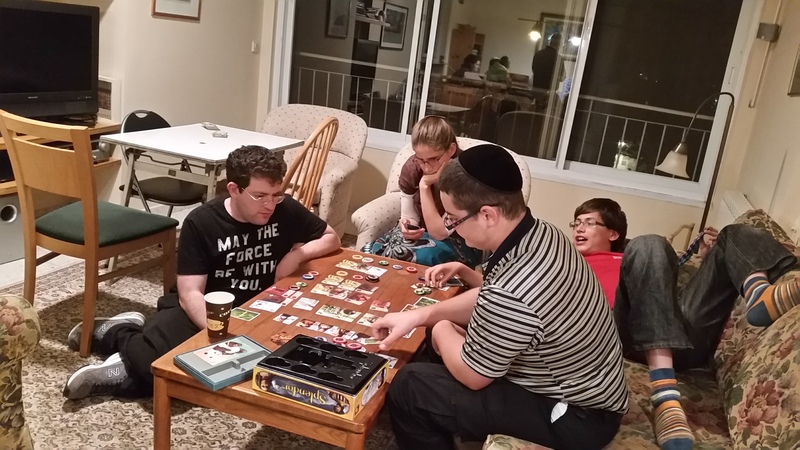 Avraham is a new guy who lives nearby and who’s just getting into board games. Those scores are approximate, since I didn’t write them down when the game ended. I’ve always found this game to be fairly enjoyable, if not stellar, but I enjoyed this session more than most. Maybe because I won. Max and Sergei were first time players. Sergei emptied his hand fairly early, winning the first two battles, as well as the fourth, but then having and empty hand for the rest of the game. He tried to win one more battle with a five card hand that was full house; when he lost the battle, his hand was literally empty. I came in second in some of these battles, and then won the key ones I needed. I remembered mid-game that the Dogs can be used to form a simple straight flush with low cards, which helped win one of them. This was a first play for both Avraham and Sergei. They took to it well enough, although Avraham thought it was a bit too long. We played on France, without the northeast area. I started alone in the south, Max in the east, and the others fighting around Paris and suburbs. I remained undisturbed until mid-game. The game eventually came down to who could buy the best plant capacity. Max started off with the most in the end-game, but and incremental plant I bought allowed Nadine to buy a better plant with which she was able to win the game. 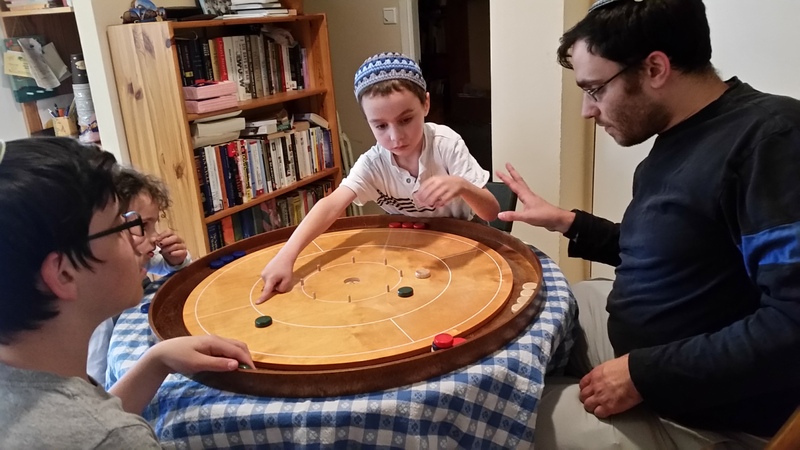 I introduced Avraham to this game. We first tried the basic version, which I lost soundly. It’s really quite different in strategy from the advanced version. It’s slightly better in one sense, in that the lower cost tiles are also beneficial. But it lacks a certain depth. And then we played the advanced version. I ended the game, but I couldn’t beat Avraham’s coffin laden board. I don’t think I even pocked any coffins in the game. We tried two variants: 1) Buying out of the graveyard for two coins instead of face value. This didn’t work, as it made the Villager cards less useful. 2) Combine coins and cards for when you could use cards. This had the effect I knew it would, making cards simply feel like cash, which I don’t like. As far as I’m concerned, the game stays the way it is. 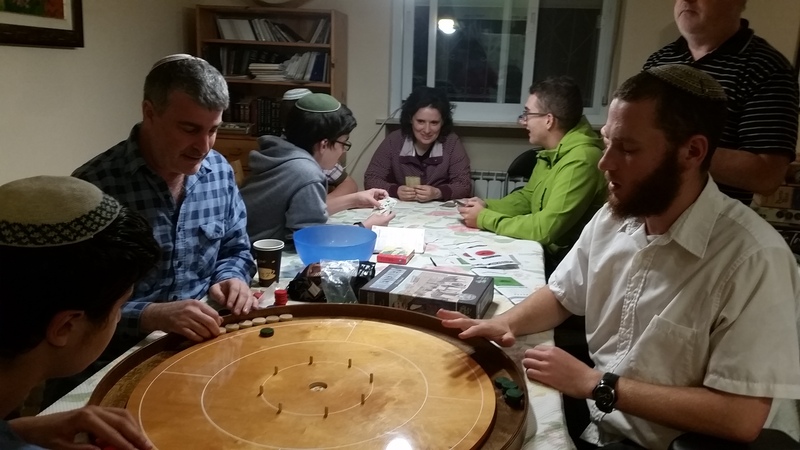 El-ad is a friend of Shachar’s who showed up in the middle of games night. 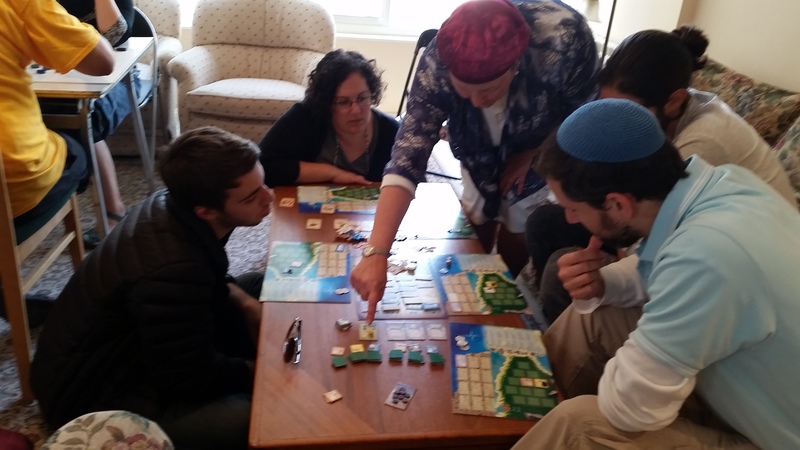 Mace and Shachar arrived early and played this two-player while I finished organizing my life. They needed a few rule lookups during the game, but otherwise managed ok. By the time they were done, El-ad showed up. I like this little filler game. After this play, my third play, I just started thinking about new levels of strategy and tactics for the game. I believe that a careful player should be able to count several moves ahead to determine if a path is worthwhile or not. Also, the game becomes more confrontational as it goes on. It’s quite nice. I wish I could get the others to like it as much as I do. This was my first play, and second or third for the others. As was expected, I really don’t like dice combat mechanisms, and this one was no exception. Which is a shame, because I liked every other aspect of the game. Pirate’s Cove is a blind bidding game. Each player has four stats: initiative, two combat stats of which the lowest one determines how many combat dice you roll, and treasure capacity. Each round, five cards are revealed, one in each of five locations, and each player secretly decides which one to take or whether to cash in treasures already earned. Four of the five locations also allow you to increase one of your stats using earned gold, while the fifth allows you to buy power cards. If two people go for the same card, they fight. Alternately roll dice; hits are subtracted from an opponent’s stat of your choosing. An any time, or if one of your stats falls to zero, you can withdraw and fix your damaged stat and draw a power card, or draw two power cards and pay two gold to fix your stat. The remaining player gets a VP and the fought-over card. Cards give random amounts of VPs, gold, treasures which can be cashed in for VPs, and/or power cards. Power cards are worth VPs, great benefits in attacking or defense, and so on. Naturally, like the dice rolls you need, the power cards you get may or may not be the ones you need. Some are greatly better than others almost any time. It was readily apparent to me that given a rather straightforward choice between VP’s or treasures, VP’s were a better strategy. They don’t require you to waste a turn cashing them in for treasures, can’t be stolen, and require no particular capacity to store. Naturally, if everyone has this idea, there will be lots more fighting over the cards that give better VP bonuses; and, generally speaking, the player with better stats or better power cards will win fights. Or the better roller, naturally. Adding to the mix is a Big Pirate that travels around to areas 1-6 in order. Anyone who wants the card in that area also has to fight this guy first. He’s hard to kill, can do some nasty damage, and may be worth a nice or small amount of VPs. In our game, the Big Pirate gave a fair chunk of VPs. Everyone else was avoiding him, so I decided early on that the best chance of leaping ahead was to save my best power cards and take him on. Not only will I get the VPs from beating him, but then I will get the card from the area uncontested. I waited until he was in an area with a nice VP card. Took him out, gained nice points, gained even more nice points, and that was basically game, because the next Big Pirate flipped up to replace him was just as nasty but gave only half the VPs. Furthermore, it was already near the end of the game and people hadn’t been saving up just for a battle like that. So even with my average dice rolling, my planning won the day. Which made me appreciate the game. But still: dice rolling combat. Shudder. There must be a universal way to fix all games with dice rolling combat. I can’t believe that Mace has never played this before. El-ad was a total stranger, so that he hadn’t played it before wasn’t a shock. Anyway, Mace won as you can see, and they continued on for second place, which ended up being Shachar. Nadine and Yitzchak had played this once before, while Gili and I hadn’t. They had figured out most of the confusing rules from the last play, but we still had to work out a few rules issues. 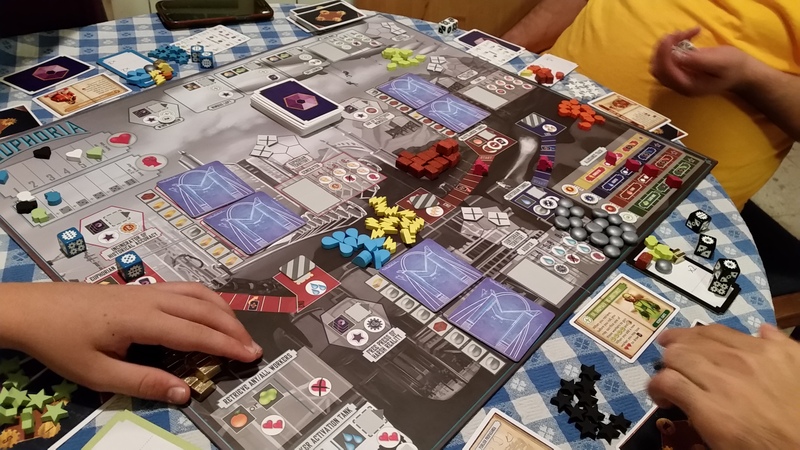 I really liked it, even though I wasn’t totally happy with the card flipping mechanics, but once again my enthusiasm wasn’t shared by everyone else. Others’ opinions ranged from ok to boring to a bit long. Vegas Showdown is an auction game with bidding similar to Amun-Re except you can rebid in the same place. You’re bidding on rooms to lay on your hotel/casino area. Each tile has doors that must connect (a lot like Alhambra) and gives varying bonuses to your income, people count, or VPs. Unlike other games, the granted income bonuses are not great; still, it’s always better to have more than less. Your best method for income is to punt and not build anything once in a while. That starts you off the next round a building’s worth of money ahead of everyone else (unless they did the same). Each round, buildings drop in prices. As the game goes on, the better and more expensive buildings show up. These require you to have bought earlier buildings (like Attika) and they have less doorways so they are harder to place. At the end of the game, you get points for transitory points gained along the way, filling in certain areas of your board, highest income or people, and having arranged the more expensive buildings in certain ways (this is the hardest and least profitable strategy, from what I could tell). In fact my victory is based on having acquired the plush transitory VP buildings around midgame, and ensuring that I got roughly the same bonuses everyone else would gain at the end of the game. I can see someone else winning by gaining one or two of the very last buildings to show up, however, which no one ended up purchasing in our game. After special buildings are bought, new ones are replaced according to a card that flips up indicating what building stack to pick from for a replacement building as well as an “event” that affects the remainder of the round. While these “events” are cute, they don’t really add much to the game. In fact, they could easily have been dispensed with and the game would have been must better. It’s not because they are “event” per se, it’s that they’re not good ones. Too many of them randomly give out bonus points to people in a game where victory is not decided by too many points, or otherwise disrupt the game flow too much. Still, I greatly enjoyed this game and would love to play again, if I can find more willing parties to join me. Game night was at Nadine’s house, since I thought I would be late. I only arrived a little late, at 7:15. They opted to play this as a starter game, promising to play quickly. It took an hour, which is quick enough, for them. Tal doesn’t play heavier games, and this is one of her favorites. Or it used to be, until she realized that her strategy of always waiting to win the last two battles didn’t always mean winning the game. Binyamin won both the first two battles, but nothing more until we finished the first seven. Tal and I took 2 and 3 of the next battles, respectively. I was ahead in points now, but it came down to the remaining two battles. If either won both of them, they would win the game. If they split, I would still be ahead. My hand was seriously depleted, so I wasn’t in the running for the last two battles at all. 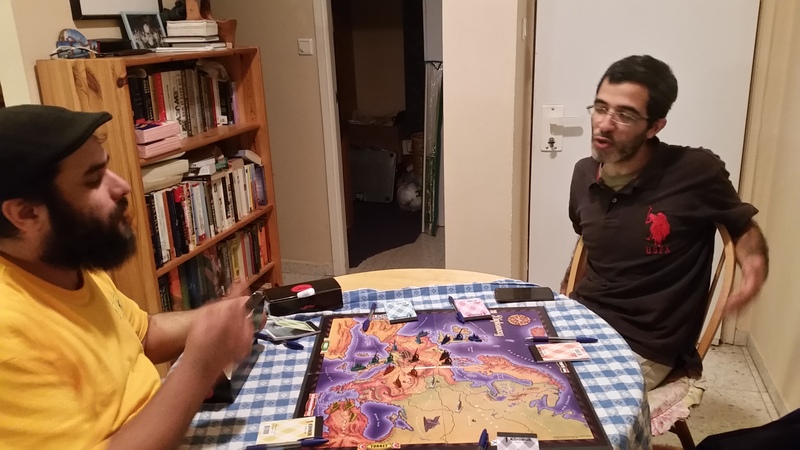 Binyamin was convinced that he wasn’t going to win either. He had the opportunity to simply not call Havoc at all, basically handing me the victory, since the eighth battle wouldn’t be fought and the remaining points wouldn’t be enough to beat me. But he didn’t. They ended up each winning one battle, which gave me the victory, anyway. 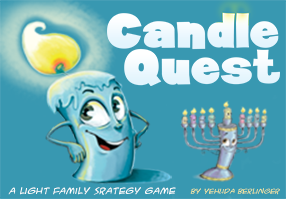 Binyamin brought this out as a filler game. 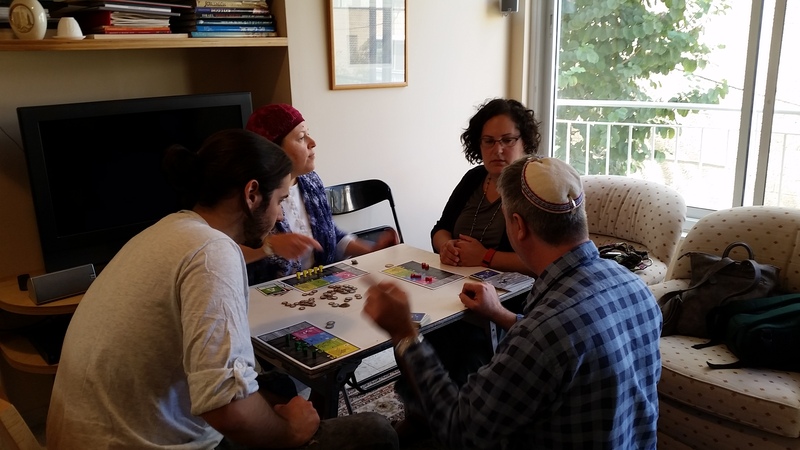 Yitzchak had only once played the regular Blokus. They played on the fancy graphics new version in German. Jesters were selling cheap. End scores in Power Grid give you little information about how the game went. This was our group’s first time on an extension board. Nadine and David spent some time picking which country and provinces in which to ply, finally settling on Western France. We played with the correct France rules which tossed out the 13 plant, put the 11 in its place, and added more nukes to the initial setup. Both of them had the opportunity to place cities on the board before me, and both chose not to take Paris fearing imminent enclosure. Instead they both placed right outside of Paris. I took Paris. And after my fourth city build, I was enclosed. 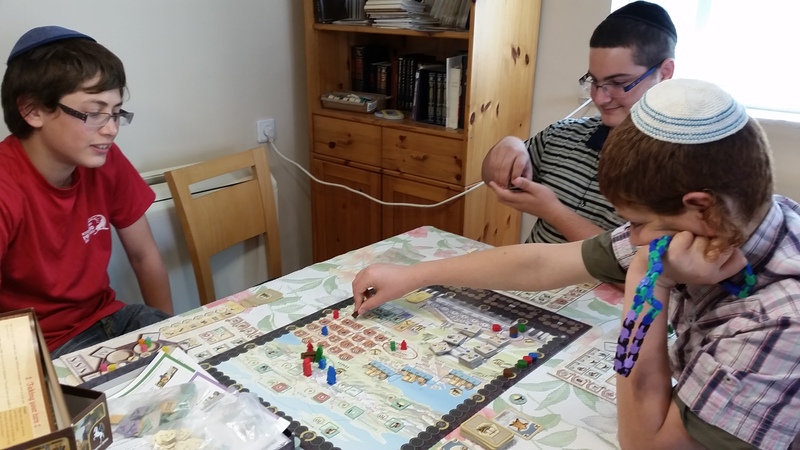 Despite this, I was earning more cash than either of them, which allowed me to jump across the board to mid-France, and then all the way down to the south coast. Resources were in short supply. Coal went first. Nadine and I were sitting in Phase 3 with 13 cities each, to David’s 10. He had plant capacity to power 15 cities, Nadine 13, and me 10. All of us were able to take a 6 power plant, giving David 17 capacity, me 13, and Nadine 17. Except Nadine couldn’t really power 17, since I kept running out the garbage fuel she needed. In the last round, we finished all the big power plants, netting me a maximum power capacity of 16. 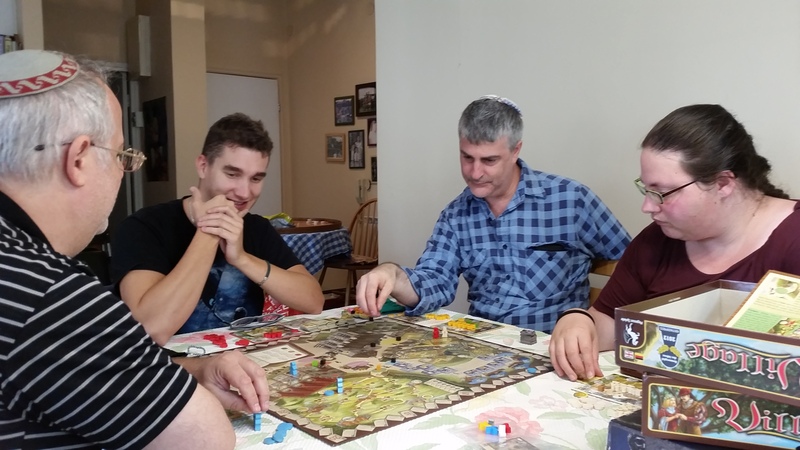 There were no more plants I could get, so I was bound to lose if David could build the cities. Nadine tossed her 7 garbage plant, since she could never fuel it, and instead took the 50. So she was also now limited to 16 capacity. The game had to end that round for me to win; otherwise David would just build 3 cities this turn, 4 the next, and power all 17. Luckily he wasn’t able to get even to 16 cities in this turn, so I built to 17, being able to power 16 of them. Nadine could also build to 16, but had far less cash, even having to build one less city. If you followed all that, you’re a genius. Binyamin find the new graphics gross. Yitzchak played two 5c contracts. The first he made. The second I jumped to 5c as a sacrifice bid over my his 2c bid followed by Nadine’s 2h. 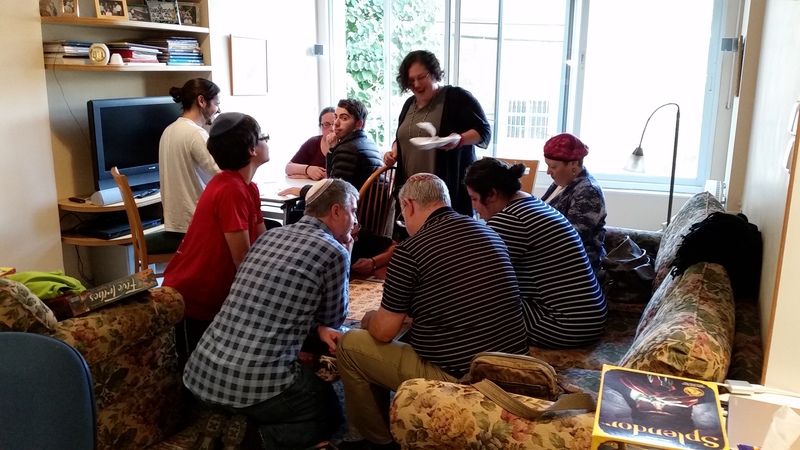 Binyamin doubled, and Yitzchak redoubled. Yitzchak is still a bit new to the bidding game, and so didn’t realize I was sacrificing; he thought I was powerful. And forgot that I had initially passed. Turns out we only went down one. He had 7 clubs. And our opponents were cold for 5h, and might have made 6h.